Gauge charts are useful for comparing values between a small number of variables either by using multiple needles on the same gauge or by using multiple gauges. A gauge is a very common chart used in information dashboards and you can use a gauge when you want to show a single value within a given scale. These charts typically show a key indicator within a range of values, employing a semaphoric color code (eg: green, yellow, red). Gauge charts use needles to show information as a reading on a dial. The value for each needle is easily read against the colored data range. 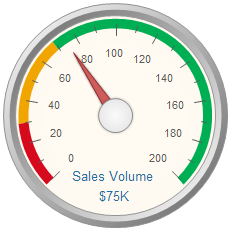 Gauge charts can be used to show the revenue and planned revenue for each sales territory. These gauges charts below demonstrates a single value represented by a red needle. Gauge charts allow us to visualize data in a way that resembles a real-life speedometer needle or a regular gauge. They usually display a single key measure. The outer scale of the gauge is often color-coded to provide additional performance context. The picture below shows some examples of linear gauges charts. You will be surely impressed when you first see the gauges charts because they look pretty cool. Aren't they? Although gauges chart looks quite beautiful, it may be a little bit difficult to draw one by hand. No worries, you can quickly draw a gauges chart with a Gauges Chart Maker. 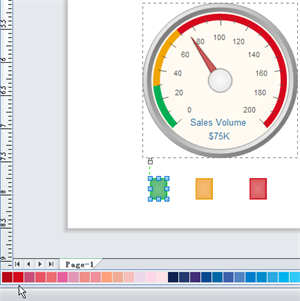 Now we will clearly show how to draw a gauges chart with gauges chart maker. First things first, choose a gauges shape you like from the library which is on the left of the canvas. Drag and drop the gauges shape you have chosen on the drawing page. On the upper right of the gauges shape, you may find a floating button as the picture shows below. There are a few options showing on the floating button. The first option is "Load Data from File". The default data is text (.txt) file. Tips: Edraw also supports csv file, text and csv file exported by Excel. If you installed Office Excel, Edraw can load xls and xlsx file. The arrangement of the data should be as the picture below. From the floating button, choose the option "Set Gauges Data�? then the small window below appear. You may find that the default min scale and max scale are 0 to 100. Moreover, the default tick number is 20. You may customize these figures according to your own needs. You may also set the other options from the floating button like range number, range data, legend, etc. Here is a user who wants to draw a gauges chart that the $0-30K range should be in RED, the 30-70K should be ORANGE, and the 70-200K range should be in GREEN. When Looking at this in sales numbers, if his employees have booked $75,000 out of $200,000 dollars, they are on the right track and their number will be Green. However, he tried many time but failed. I bet that you may meet the same problem, so we will show you how to achieve the desirable result. 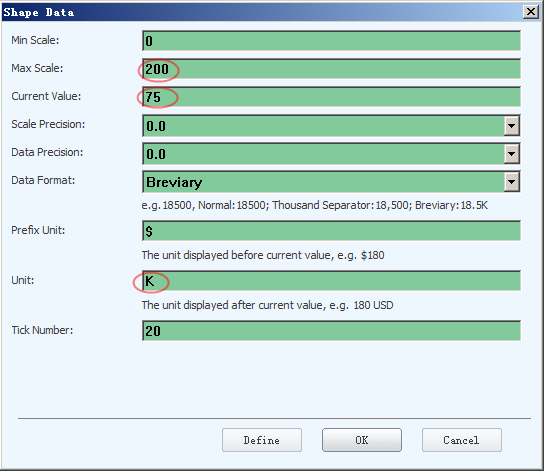 First thing first, double click the option "gauge data", set the maxt scale"200", current value"75", unit"K". Second, show the legend on the bottom, and select the $0-30K range button on the legend, and click the quick color bar on the bottom of drawing page to change the range color. Repeat the step to change rest two range colors. Multiple gauges may also be rendered on a single chart surface. Therefore, you many choose more than one gauges to visually display your date from different aspects.